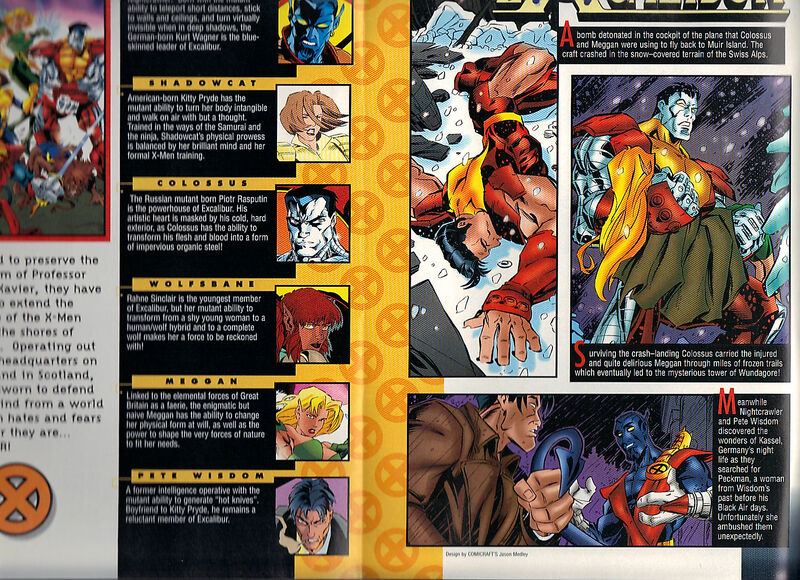 This was during the great time, at Marvel, when they were doing gatefold covers, with a very informative inside cover. Unfortunately, for Excalibur, this is also the time that Ben Raab was given the editorial mandate to break up Pryde and Wisdom and slowly bring Excalibur to an end. Inside gatefold cover ad is for the new TNBC lineup – Saved by the Bell : the New Class / Hang Time / City Guys / NBA Inside Stuff. I was still watching these first three shows. I still wish Megan Parlen still acted. Whenever I see Anthony Anderson, which is pretty regularly, I think of Hang Time. The cast of the title is – Nightcrawler / Shadowcat / Colossus / Wolfsbane / Meggan and Pete Wisdom. What happened previously – Colossus and Meggan were traveling back to Muir Island, when a bomb went off in their plane. Now they are stranded in the Swiss Alps. Colossus, while carrying Meggan, has lead them to Wundagore, and unless you are going to see Bova, the sweet cow lady – it is never a good idea to go to where the High Evolutionary lives. Meanwhile, Kurt and Wisdom are in Kassel, Germany – looking for Wisdom’s old Black Air friend, Peckman. She finds them, before they find her and ambushes them. Rahne hugs Moira goodbye, as she is heading towards New Mutants : Truth or Dare reunion miniseries. So great that they are making a point of writing Rahne out of the title, for an issue. For some reason, Rahne is going to Westchester, on a boat. I guess if Colossus took one plane and Kurt & Wisdom took another, they don’t have a third plane but that still seems weird. Moira is worried about Bastion, as this is during the Operation : Zero Tolerance era. The two ladies are sad, as Moira is dying and her time is limited (though we know, now, that she has a couple more years) but Rahne only sees her former teammates, on rare occasions. Before her boat can ship, Douglock comes running along, to give her her diary. They kiss goodbye, which surprises the both of them. Odd that Douglock isn’t coming along for the reunion – as he counts for two New Mutant members. Was there ever a follow up story with Rahne and Warlock, about their brief romance during this era? I don’t recall that. Wundagore. Colossus and Meggan are awakened by Bova. Bova warns that a war is coming and Colossus recognizes the name. Bova, shyly, brings up that she is a friend of the Avengers. Sir Ram gives Bova grief for bringing new faces to the tower. Sir Ram recognizes Colossus and instantly wants to murder him! Colossus armors up and this surprises Sir Ram, so I’m not sure who he thought Colossus was. Colossus recognizes the name, Wundagore, but not sure from where. That guy is the worst. Sir Ram knows Colossus from his Acolyte days. By days, I mean, literally days, I don’t think he was a member for that long. Exodus is running that crew now and he may be at war with the High Evolutionary. Sir Ram disrespects Meggan by calling her “a little minx” and she tosses him up in the air and he gets stuck on one of the ledges. Kassel, Germany. Wisdom is chained to a column. Peckman has not only tied him up, but placed a neural inhibitor on the back of his neck – so he can’t melt the chains. Kurt is nowhere to be seen. There is a splinter group of rogue Black Air that she is a member of. Wundagore. Lord Gator and Grizzly Lady Ursula, are leading the troops, as they prepare for battle with Exodus. Gator doesn’t trust Colossus but he tries to prove his worth with how Exodus’ battle strategy would be. I can never spell “strategy” right, the first time. Just then, a voice silences Colossus. Back at Muir Island. Douglock and Moira are talking about how Lockheed is missing and how Kitty is looking for him. He’s been missing for eleven issues, or almost a year – our time. Lockheed, who is being drawn like a Disney character. 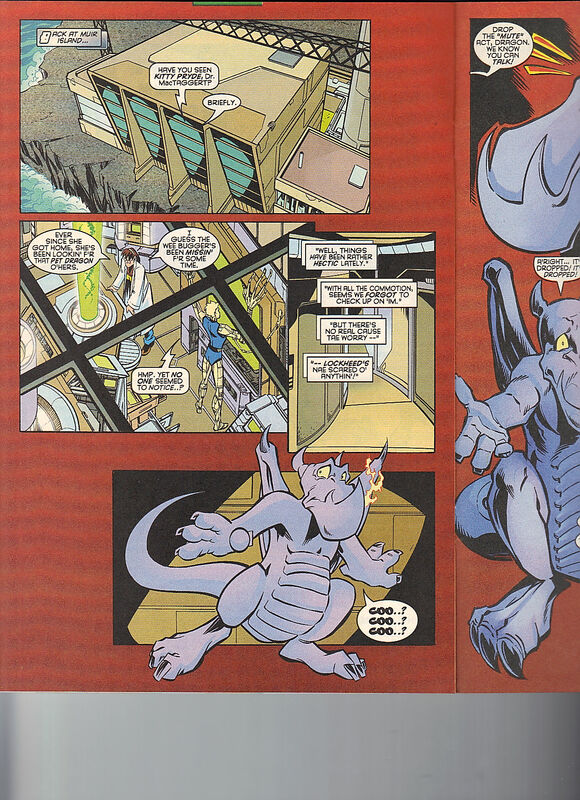 Poor Lockheed is being hunted and taunted. Lockheed is confused, as he thought these peeps were his friends – which makes them laugh. As we won’t be revisiting this, for some time, these are evil Bamfs that will be coming to their own storyline, soon. In the air, towards New York. Rahne is glad to be seeing Cannonball, Sunspot, Karma and Dani again. She wishes Illyana could be there, but she’s dead now, as is Doug. Another odd reason for not including Douglock. Maybe Raab didn’t want to lose two characters for a few issues. Not like Douglock is doing anything at the moment. Rahne enjoyed that kiss with Douglock. Wundagore. High Evolutionary has two items that Exodus wants – the tower and Magneto’s granddaughter, Quicksilver and Crystal’s daughter, Luna. Apparently, Crystal is dead and Quicksilver is having High Evolutionary watch over Luna, as he mourns Crystal. Which is insane to me! I’m sure Luna is mourning her too and probably wants and needs her father at a time like this. That Quicksilver is a douche bag! At this time, I was really enjoying Quicksilver’s solo title but I must not have had this thought, back in the day. High Evolutionary last saw Colossus during the Evolutionary War, way back in Uncanny X-Men Annual 12. Which came out in 1988, which was then nine years ago. High Evolutionary doesn’t need Colossus and tells the two of them to leave. Bullpen Bulletins. X-Force 70 starts their “on the road again” storyline. Men in Black came out. Spectacular Spider-Man 250 is coming out, with the Green Goblin! Stan Lee answers a few questions – his thoughts on Heroes Reborn, any regrets not writing novels and any news about the X-Men film which is still three years away. I don’t own any of these but I know I read Deadpool, Spectacular Spider-Man and the Captain America title. The Heroes Reborn titles did a silly crossover for their 13th (and final) issues as Lee / Liefeld’s contracts were only good for twelve issues / one year. I also read X-Force and maybe the Wolverine issue. High Evolutionary teleports (with a wave of his hand) Colossus and Meggan to Paris (as the Eiffel Tower is in the background). This sets up the Colossus One Shot, that guest stars Meggan. 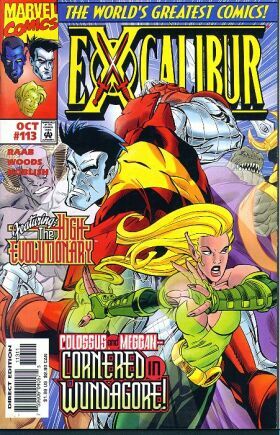 Not sure why they didn’t bill it as “Excalibur : Colossus & Meggan” they would have in today’s marketplace. SwordStrokes, letters are from – Michael Slark of Mackenzie, BC, Canada and David Newbold of Long Eaton, Nottingham, England. Next Issue : Pete Wisdom held captive! Colossus and Meggan back from his one-shot! Lockheed resurfaces! And Kitty Pryde is off to become an Agent of SHIELD! All that in just 22 pages! In only 30 days! Except, we won’t be as this the end of our third Lockheed Month! Thanks for joining us for the fun. This is also, Post 975!! !